Douglas Tank Sales is a leading tank dealer and tank service company. We specialize in used tank sales and tank restoration. Douglas Tank Sales offers competitive prices for water tanks, chemical tanks, and other industrial and commercial tanks. Whether you need a new tank or are looking into tank restoration, our experienced, qualified sales staff has many years’ experience in the industry, and will help you find the right tank for your needs. These modifications can be made to meet your exact requirements. Based on design drawings or even just simple sketches, Douglas Tank Sales can create the perfect custom tank for your facility. 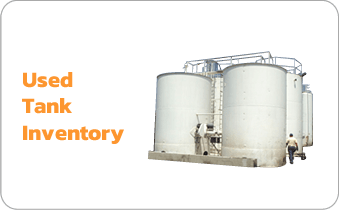 Use our tank volume calculator to find the tank capacity you need, or to find the volume of an existing tank for accurate replacement sizing. As a leading tank dealer, Douglas Tank Sales offers a variety of secondary services. We can install tanks, remove existing tanks, perform engineering work for your tank system, provide and install concrete foundations for tanks, and provide and install piping systems for certain applications. We also offer transportation quotes for delivering a tank to your location. All tanks sold by Douglas Tank Sales are thoroughly tested and guaranteed. We perform pressure tests and water tests to ensure that the tank you buy from us doesn’t leak. We also test electrical systems, pumps, and any other tank components to guarantee proper performance. Douglas Tank Sales is your number one choice among industrial and commercial tank dealers. Contact us today to find the storage tank, mixing tank, pressure tank, or custom tank you need. As a leading tank dealer, Douglas Tank Sales offers a variety of secondary services. We can install tanks, remove existing tanks, perform engineering work for your tank system, provide and install concrete foundations for tanks, and provide and install piping systems for certain applications. We also offer transportation quotes for delivering a tank to your location.